Ben Alagnam: Durians in Singapore: Where to Buy the Best Durians? Durians in Singapore: Where to Buy the Best Durians? "Eewww! ", this is the reaction of my housemate when I offered him the fruit. He can't bare the smell of it and more if he eats it. 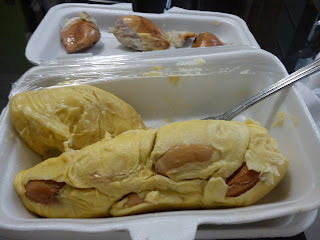 I don't know why people hated Durian so much that they won't bother to taste it. It's probably the design of our noses. Some may have too sensitive sensory glands that they detect Durian as a different smell...like poop. Durian is regarded by many people in South East Asia as the "King of Fruits", probably because of the thorns that resembles the King's crown or because no fruit can match the penetration ability of its smell, even if placed in a tight container. 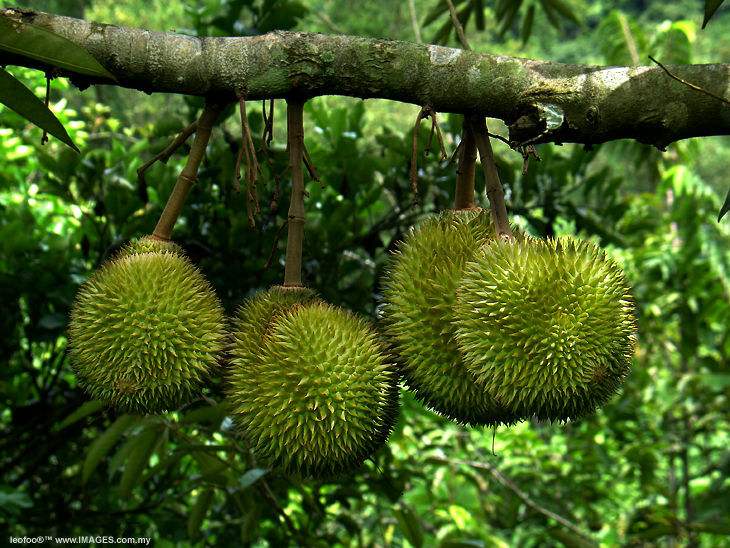 Durian is a seasonal fruit bearing tree. But in Singapore, you can buy Durian anytime you want. There are many species of Durian, probably about 30 of them, but the distinction that is more obvious to us are the taste and colour. The colour of Durian meat that I prefer is yellow, there are durians that has pale yellow meat, which is still fine for me. Durian are classified and labelled according to their taste and color. 1. Black Pearl - It has small seeds in it and is slightly bitter, very pale yellow with gray undertone meat. 2. Green Bamboo - The colour is pale yellow and it has a fibrous meat in it and is sweet. 3. Red Prawn - sticky and sweet orange-red meat. 4. D101 - Not so sweet but creamy. 5. D1 - Milky or creamy in taste and has a pale yellow meat. 6. D13 - This is for beginners, for it is not strong in taste but sweet. Dark orange in colour. 7. D24 - It's a pale yellow, creamy and bitter taste. 8. XO - The name is taken from the alcoholic beverage taste of XO. Extremely soft and bitter. 9. Golden Phoenix - Juicy and bitter in taste and the colour is pale white-yellow meat. 10. Mao Shan Wang - the most popular and expensive of all durians. It is also called as the "Musang King". It has a bright yellow, creamy and sticky texture. It's has a combination of sweet and bitter taste in one fruit. The three most popular among those durians are the D24, XO and Mao Shan Wang (Musang King). The price of D24 is (S$8 to S$18/kg) and for the XO is (S$8 to S$18/kg) and lastly for the Musang King is (S$15 to S$25/kg). In Singapore, majority of the markets here have durian stands, where they sell different types of durian as listed above. One thing that you need to know is that you cannot bring durian inside the MRT. This is not allowed here in Singapore. You may eat it before boarding the Train or buy durian at your nearest market and you can walk or ride the bus on your way home. I bought this from NTUC Fairprice for S$4 - $5 dollars per pack, which I ate awhile ago. It's already good for 1 to 2 persons. But for me, it's good for one. Haha! You can visit the Geylang Area, along Sims Avenue to see the different varieties of Durian. Just tell the vendor on what type of Durian you like. I recommend you to buy the low quality first, usually they are priced for S$10 for 3 small fruit. Then, go for the most popular Durians like D24, XO, and the ultimate is the Musang King, sold per kilogram. A Durian usually weighs about 1.5 kg/fruit. Through this, you can taste the durians of different varieties. Just make sure that you go home without burping, cause your burp is always mistaken as farts, specially in air conditioned area. Stores have small tables where you can let the vendor open the durian and serve it to you just like eating in an open restaurant. You can return the durian if their are some defects or rotten parts. The water is provided for you for FREE that are located at one corner of every store. How to Go To Sims Avenue? Alight at the Aljunied MRT Station, walk to Lorong 25 Geylang and it connects to Sims Avenue. Go right and look for the stores that sells durian. They are along that area.